The Great Room features almost 2,500 square feet of meeting space with 15-foot ceilings and is designed to be divided into three distinct function rooms - each measuring around 800 square feet. Each room is installed with its own LCD projector and screen, computer with Microsoft Office, DVD and VHS players and document camera. Wireless and handheld microphones are also available, and Wi-Fi is present throughout in the Great Room. 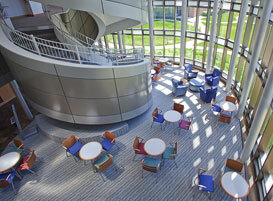 The space can be designed with round tables or a variety of other layouts. It is ideal for events including training, an opening session or a luncheon. 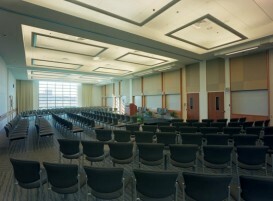 The room also provides natural lighting, and videoconferencing is available.